Research shows that people who follow a zero-based budgeting system like this one pay off 19% more debt and save 18% more money than those who don't! 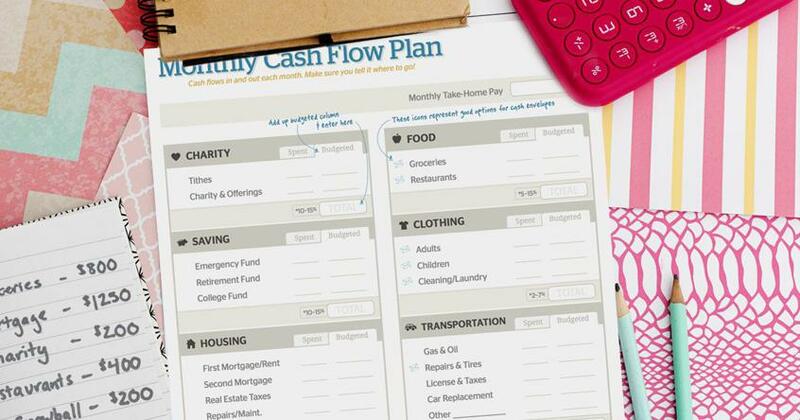 Download our free budgeting form now. Are you itching to know what’s going to be cool and what’s going to be lame in 2013? Check out our list of the ins and outs to kick off the new year. Without a doubt, 2012 was quite a year for Dave Ramsey and team. Take a look at some of the online highlights! Over here at Dave Ramsey’s office, we have some pretty active Twitter users. So we thought now would be a great time to share some of their best tweets from the past year. It was during the holidays just two years ago that Shawn and Amber made a life-changing decision. That simple action is what made this year’s merry different Christmas possible. Read their incredible story. Each week leading up until Christmas, Dave gave away up to $15,000 cash live on The Dave Ramsey Show. This final week's winner was Norm from California. Let's take a look at some of the more memorable characters from Christmas movies and ask the question: What can they teach us about money and success? Dave’s entire team shut the office doors one afternoon to do something a little different as team in the community. Watch the video! A recent survey of more than 1,000 retired 401(k) participants identified six specific actions these confident retirees took as they saved for retirement. By taking the approach of paying off your highest-interest debt first, you ignore some of the most crucial elements of becoming debt-free. Find out three crucial elements to become debt-free as soon as you can. Let’s have a little fun and imagine what it would be like to buy some of the most extravagant, ridiculous gifts that are currently in the marketplace and available for purchase. We asked Dave’s Facebook fans to tell us some of the worst money advice they’ve heard—both at the Christmas dinner table and out on the town. Can you relate? Christmas isn’t just about giving—it’s about people. And these three organizations are dedicated to helping people. Blogger Tsh Oxenreider explains why secretly giving this annual gift is one of her family's favorite ways to give during Christmas. Each week leading up until Christmas, Dave is giving away at least $10,000 live on The Dave Ramsey Show. This week's winner was Denise from Illinois. Does this video seem all too familiar in your life? Make it different this year and don't let the January you hate the December you.